Every year readers ask me where they can find “you-pick” places in the Wichita area. They’re talking about the orchards and farms where families can go pick fresh produce right off the tree or vine. This is so much fun to do, and it’s a great way to enjoy fresh air and sunshine together as a family. The challenge is that this is seasonal, and not all produce shares the same season, of course! For years I only knew of a few places nearby that offered this. With the help of a few friends, readers, and the internet, I’ve found some local farms that welcome their customers to pick fruit from their fields. Some of them require an appointment, so be sure you visit their websites or give them a call before you plan your day. Do you have a favorite “you-pick” place near Wichita that isn’t on my list? Please let us know about it in the comments! Spring is the season for you-pick berries: strawberries, blueberries, blackberries, etc. Here are you-pick farms near Wichita that offer berry-picking. You-pick strawberries should begin in mid-May. Peaches, apples, and pumpkins later in the year. 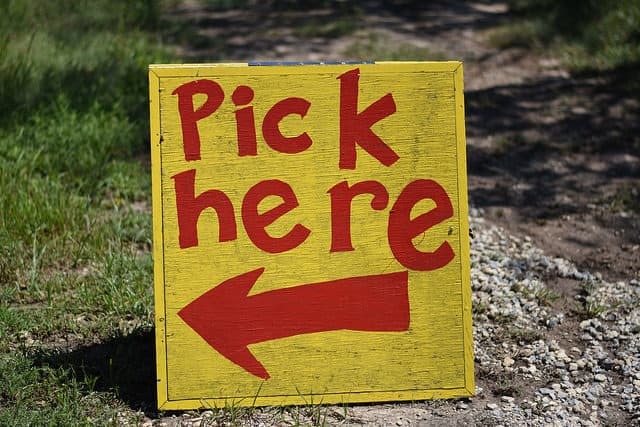 Find out what’s ready to pick before you go by calling them or watching their Facebook page. You-pick strawberries, usually May to June and you-pick blackberries, usually later in June and July. Sell other fruits and vegetables at its store. Pick-your-own strawberries and blackberries in Sterling, KS. Strawberries mid-May into June. Blackberries in July. They also have the Tenth Street Orchard Vintage Market in May. Sterling is just about 30 minutes northwest of Hutchinson. You-pick blueberries and blackberries by appointment only in June, July and sometimes August. They also bring their berries in to Wichita to the farmers markets. We have two lavender festivals in Kansas (that I know of)! Pick your own or buy bundles at Gertie’s Lavender Festival or the Prairie Lavender Festival. You-pick peaches, apples, pumpkins and a variety of vegetables is usually June to October (phone or see website for details), or purchase at the farm store on site. Or local farmer’s markets.Farm sells farm-made Hard Apple Cider. Apple and peach orchard. Recommended by several readers. Orchard is only open when fruit is ready, so phone first. You-pick peaches usually mid-July into August. You-pick and already-picked apples, usually from later August to mid October. Bring cash or check. Internet service not reliable for card reader. Call for an appointment. 1345 W. 90th Ave N.
Not far from Wichita, in Buhler, KS, Gaeddert Farms offers u-pick pumpkins and – new this year – sunflowers! The sunflower festival is mid-September when they’re blooming, so it’s very weather dependent. Be sure to check out their website before you head out to make sure you know what’s in season. Produce in the store, as well as you-pick peaches and apples, usually July and August. No you-pick peaches this year; an April freeze hit some orchards pretty hard! You-pick peaches usually June, July and August, along with a fresh produce market. Are any of these farms organic? Steffens do not have a website, but they do also have peaches in the summer. I would suggest just calling Nick or Mary to see what’s available. Great people, great place! BEAL ORCHARD in Harper, Kansas. We have been here for 18 years. We grow peaches, apples, nectarines, tomatoes, onions, peppers, potatoes, green beans, asparagus, cantaloupe, pumpkins. We have always been a U-pick orchard for apples and peaches. We have a country store where we sell everything we grow. Due to the late freezes the last couple of years, u-pick may be limited.